Welcome to our private, open concept, cozy studio in the trendy Beach neighbourhood. Secluded street one minute walk from the lake. Steps from the TTC, (Public Transit), Queen St. East shopping, restaurants and bars. This is a private and cozy, non-smoking, pet-free basement apartment that is newly furnished and fully equipped. ** Please take notice: In our continued efforts to be transparent, this is a centenarian home in an historic, beautiful and quaint, old neighbourhood. The house has its own quirks and as in all old homes sounds can travel. We have tenants upstairs, if you're sensitive to the footsteps that can travel between floors please consider this. There is one bedroom in an open concept space, as shown in photos. There is a full double bed and closet with hangers. There is also a fold-out futon for a third guest. There is a full kitchen with an oven, fridge, toaster, microwave, kettle, coffee press and necessities such as sugar, spices, complimentary coffee and tea and some other bonuses. The kitchen has double glass doors which allows for plenty of sunlight. The doors walk out to the private patio with table and chairs. There is a separate living area with a fold-out futon, a new flatscreen TV with Netflix, and a dining table with two chairs (extra fold out chairs available). There is a private, two-piece bathroom with a separate shower. Please enjoy free, high-speed, unlimited WIFI and Netflix. When you are outside the home doing your thing, you can obtain free internet access all over the city. There is free, daytime street parking on your street. **To park after midnight until 8am, you will need a temporary street permit from the city which is inexpensive and easily obtained online, but please let us know if you need to purchase one and we can certainly help in arranging that for you. The location is on one of the most sought-after and secluded streets in the trendy Beach neighbourhood and, literally, a thirty second walk to the beach, lake and boardwalk. It is also less than a minute walk to Queen St. where you will find everything you need: Grocery stores, boutique shopping, restaurants and bars, hip pubs, cafés and "The Fox Theatre" (an historic repertoire movie theatre). I bought this gorgeous 4 bedroom house on a cul-de-sac in my favourite 'hood in Toronto, The Beach. I planned to live in it, but plans changed... I've kept it as a rental property since 2003. I renovated the one bedroom, open concept, bright basement apartment in the house in 2015. It looks out on to a private beautifully landscaped garden with a pond from your own small patio. You are a 30 second walk to the lake, beach, and boardwalk. Beautiful in all 4 seasons! In the quaint Beach Village. A minute walk to Queen St. East. Grocery stores, boutique shopping, restaurants and bars, hip pubs, cafés and "The Fox Theatre" . Literally a thirty second walk to the lake. 5 large beaches on Lake Ontario with tennis, paddle boarding, kayaking, volleyball, swimming, sailing & the 3 km long boardwalk. Central air, controlled by the tenants living upstairs. There are 3 multi-speed fans. Two oscillate and one has remote control. Central heat controlled by tenants, there is an additional space heater. Street parking, unlimited and free between 8AM-Midnight, from midnight-8 AM you need a temporary street permit. You can download from the City, very easy, inexpensive and quick. Full access, unlimited high speed internet. with pull-out futon bed and flat screen TV, Netflix is free. All cooking supplies, pots, pans, knives, cutlery, spices, olive oil, etc are supplied. Dining table and chairs are supplied. flat screen TV, Netflix is free. Small, private patio is supplied. You will need to go down/up 5 outdoor steps. Free Public pool nearby and the lake a minute walk from the apartment. Enjoyed the space very much. Great location. Plenty to explore and visit. Super nice property managers. Really helpful and attentive. Will definitely recommend and revisit. My daughter and I rented this little bachelor apartment for a weekend. It was very nice and cozy. The owner is very friendly and contacted us when we got in to make sure we had everything we needed and he came to introduce himself and explained the area. I will for sure rent this place when I go back. Misleading description! Booked a hotel room rather than stay. 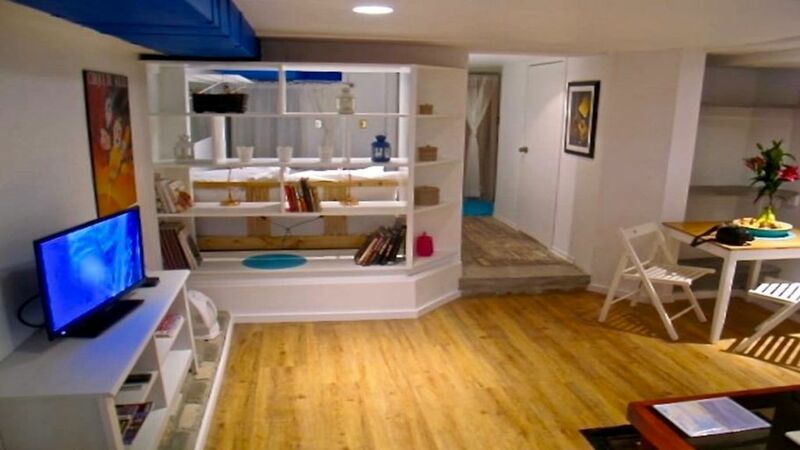 The description of the place noted that the apartment was a basement studio. The pictures mostly represent the place well. Where I was mislead was in the description of the deck and the view from the deck. This is a direct quote from the owners review "What makes this house unique: I renovated the one bedroom, open concept, bright basement apartment in the house in 2015. It looks out on to a private beautifully landscaped garden with a pond from your own small patio. ..." The small patio is literally underneath the steps of the deck for the main floor of the house. The view (if you look through the stair runners of the deck that is OVERTOP of the little space) is of overgrown weeds. There is absolutely no view, and there is nothing that is "beautifully landscaped." This was a very misleading description, and I ended up booking a hotel for the night we had reserved this room. I pointed this out to Carlos and I requested a refund. Carlos was not even going to refund the cleaning fee (WE DIDN'T EVEN STAY THERE), but eventually returned that. Even though the description was SO misleading, we received no other money back. This was a very disappointing experience. Here is an excerpt from the text exchange from Carlos after I pointed out the misleading description ... "Chris, maybe where you went wrong was with interpretation as you've done here. I never said in my description that the view is beautiful, that the patio was beautiful, or that I was beautiful." I have the screen shots of his description that I am sending into to VRBO to report as misleading. All I can say is renter beware. Unfortunately, Chris and I didn’t have a good experience on this booking. We have rented out this Beach apartment, (on another site) for over 3 years and have had 98% rave reviews. We just began using VRBO this summer. We have never had someone walk in and walk out. He booked on the 2nd of weekend in July which is high season in the beach. As he had quoted here, the view from your own small patio is a beautifully landscaped garden with a pond. Which, is all true. It is not the flowing gardens of Babylon or Luxembourg, but it is very charming and beautiful. There are no overgrown weeds, or actually, weeds of any kind. My wife and I aren’t really sure how anyone would expect a basement apartment to have a patio that isn’t also below ground level. Seems intuitive, doesn’t it? Also, in the check in description we sent to Chris, it tells him clearly that he must got down 4 steps to the private patio to enter the apartment. (It also states that in our listing for those with mobility issues as a matter of transparency). We’ve never tried to mislead anyone about the patio or garden, and no one has been mislead or misinterpreted our description before or since Chris. Then sadly Chris goes a tad overboard as he characterizes our Description as SO misleading. A tad dramatic and more than a tad weird. Our Description is 100% accurate and we haven’t changed one word since this unique episode. We can say from our experience in dealing with him, it was very disappointing. He correctly quoted me as saying, “Chris, maybe where you went wrong was with interpretation as you've done here. I never said in my description that the view is beautiful, that the patio was beautiful, or that I was beautiful." At this point he was getting so unreasonable I tried humour, but maybe in Iowa, they don’t have a lot of humour down there, perhaps the same way they misinterpret tall grass, ferns, cattails and water lilies as overgrown weeds. All we can say is, Hosts beware… review 1/2 star….